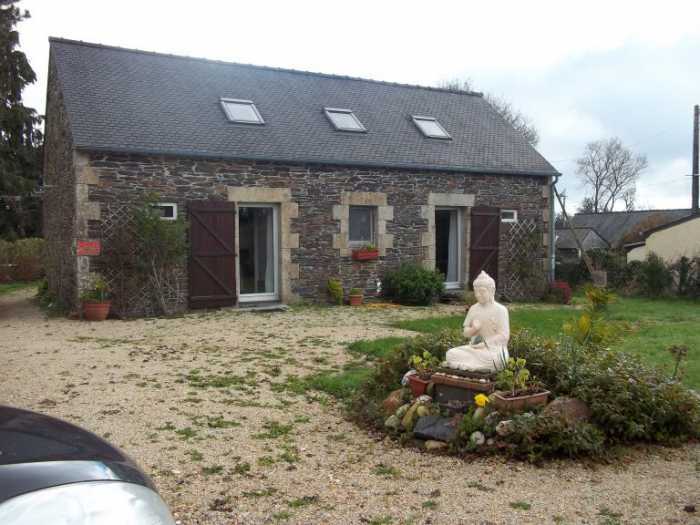 Properties for sale in Brittany, France - AHIB-3-M2240-2914993 Nr Scrignac 29640 Lovely stone house with a private garden of 1,646m² in a great environment! It is an 'L' shaped house, it looks small from the outside but is actually quite spacious. On the ground floor is the main room presently used as a comfortable lounge with fireplace and efficient wood burner, it's a very bright room with a glass door and large windows. Still on this level, there's a utility room with a WC, a dining room with a glass door opening into the front garden; further, a double bedroom with a glass door opening into the front garden and a bathroom with bathtub and WC.